I am so loving this fall weather we have been having here in NY. two weeks ago it hit 90 and this morning as I write it's 50 and I'm in a sweatshirt. With that being said let's talk fall foods. I don't know about you guys but I am so happy to use the oven and slow cooker again. All the amazing flavors and ingredients that go along with fall are oh so inspiring. Inspiring like this. Spiced Pepita Bacon Brittle yep I went there! I can not even tell you how good this stuff is. Addicting as anything else involving bacon and sugar. 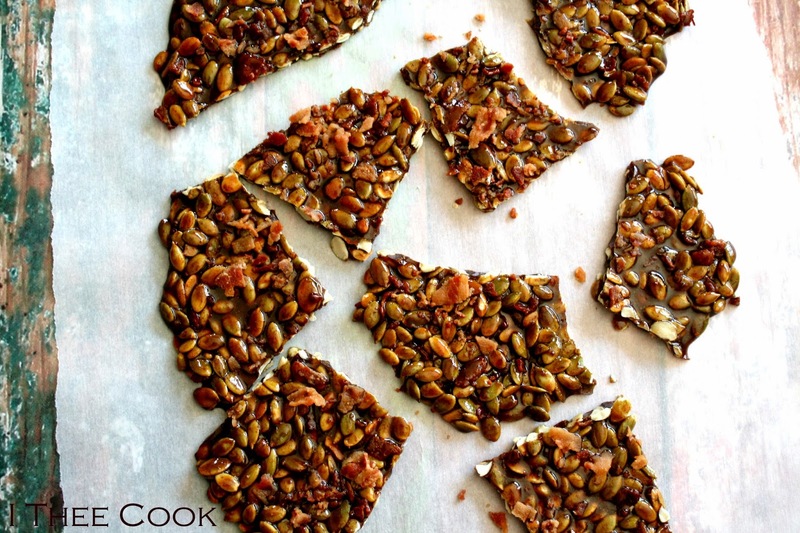 Crispy spiced pepitas covered with a crunchy candy coating oh and mixed in with bacon. Not to mention it is done in like 12 minutes flat. No need to toast the seeds, they crisp up from the heat of the caramel. Your friends and family will ask for this over and over. Good thing it's so easy to make. In a large saucepan, combine the sugar, water, butter and corn syrup and bring to a boil. Cook over moderately high heat, stirring occasionally, until the caramel is light brown and registers 300° on a candy thermometer, about 10 minutes. Remove from the heat and carefully stir in the pepitas and half of the bacon, then immediately pour the brittle scraping if need be onto a large rimmed, nonstick baking sheet. Using the back of a large spoon, spread the brittle into a thin, even layer. Sprinkle with salt and remaining bacon. Let cool completely, about 30 minutes. Break the brittle into large shards. I love this recipe! It's so easy but has that addictive combination of sweet and salty. And pumpkin seeds to add the "fall effect" since we are technically in September even though it is 105 degrees in SoCal today. Thanks for sharing! This combo looks absolutely divine! I think it would be a great teacher treat as well! We make something similar in Greece called pasteli! They look delicious! Again, thanks for coming and linking up at The Weekend Social. All posts get pinned on our pinterest board! Please be sure to come back next week starting Thursdays at 9PM EST on culinaryflavors.gr! I hope to see you there! My husband would love this! Thank you so much for linking up at Tasty Tuesday! Your recipe has been pinned to the Tasty Tuesday Pinterest board! Please join us again this week!